I’d like to take a vacation, but who has time? I’d like to take a day off, but who has time? I’d like to have an afternoon to work on a stool I started four months ago, but who has time? It seems we’re a busy people, always on the go. I get up at 4:45am every morning and walk three miles. I get ready for work and arrive a little before 8 AM. 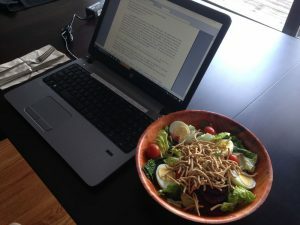 At lunch, I work on Sunday School lessons two to four days a week (some go quickly, some go slowly), and the other days I write for this or that magazine assignment. I go back to work and stay until 7 PM. 8 to 12 Noon on Saturdays. On rare occasions, I take a break during lunch and watch a woodworking video, which are very popular these days throughout the woodworking community. Sometimes I watch part of a woodworking video when I’m assembling and stirring one of the five or six lunch salads I eat each week, before I settle in to writing. I think it’s a waste. Don’t get me wrong. I like music. I have 13 gigabytes of music on my phone. I have so much music on my phone that, when I had a 16-gigabyte iPhone, I was limited to taking no more than three photographs at a time before I had to email those to myself and erase them before the storage could fit more. But, who has time? It typically takes me about four minutes to assemble and stir a salad at lunchtime. After that, it’s down to work. I simply don’t want to spend two of those minutes (or 30 seconds, for that matter) listening to music. Just take me right to the meat of the woodworking project, if you please. In fact, if there is music and/or an introductory section to the video, I’ll often fast forward a bit. As often as not I’ll overshoot, which ends up costing me more time, but, I can’t help it, I have no patience. I get some looks, but I take this bowl to lunch with me when I’m eating a salad, so I can dump the fast-food ingredients into the bowl and mix them without spilling the makings all over the place, as would happen with the low-capacity containers the salads come in. Besides, I like my dressing uniformly spread throughout the salad. What can I say? I like what I like. Now, is the music going to make me stop watching? Hardly. Will I troll someone’s videos because they have music in them? Would I write to a fellow woodworker to ask him or her to eliminate the music? Of course not play while someone is talking. Planing and a good rip saw is music too. Agree. Too often music is just a looped earworm that goes on and on and on. It is out of place in an instructional video. I appreciate the thought, but unless the video is more of a profile piece on a person or event or even a montage of the process someone uses to build something, I say leave the music out! Public television is a perfect example of overdone music. They seem to think that every dialogue sequence needs music in the background. Then the “mixer” operator (who is usually a musician,), runs the volume of the music so high that you miss many of the words. This is most frustrating. NO MUSIC when someone is SPEAKING! Rather not have music under or over the words. My hearing difficulties prevent the words from coming through if music is there. Music blurs the words. I really listen for the words as the project lesson is being presented. Music for the intro only (title, credits, location shot or brief picture that introduces the topic). No background music for the rest of it until the end credits. Silence or ambient sound only. If you think it will be boring without music or somebody speaking, then think about how you’re going to edit it down to keep it informative without losing content.